In the early 1600s, most of the scientific world believed that the planets should have circular orbits, and many believed that the Earth was the center of the solar system. Using data collected by Tycho Brahe, German astronomer Johannes Kepler developed three laws governing the motion of planetary bodies, which described their orbits as ellipses with the sun at one of the focal points (even though the orbits of many planets are nearly circular). These laws are known as Kepler’s Laws of Planetary Motion. Kepler’s First Law of Planetary Motion states that the orbits of planetary bodies are ellipses with the sun at one of the two foci of the ellipse. Kepler’s Second Law of Planetary Motion states that if you were to draw a line from the sun to the orbiting body, the body would sweep out equal areas along the ellipse in equal amounts of time. This is easier to observe graphically. 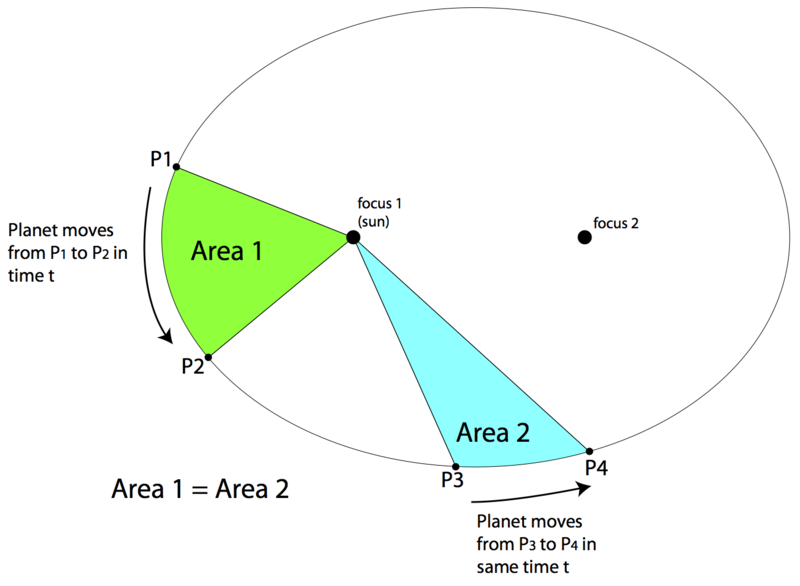 In the diagram, if the orbiting body moves from point 1 to point 2 in the same amount of time as it moves from point 3 to point 4, then areas A1 and A2 must also be equal. Kepler’s 3rd Law of Planetary Motion, described several years after the first two laws were published, states that the ratio of the squares of the periods of two planets is equal to the ratio of the cubes of their semi-major axes. If this sounds confusing, don’t worry, once again it’s not as bad as it looks. The semi-major axis is the distance of the planet from the sun. What this is really saying, then, is that planets that are closer to the sun (with a smaller semi-major axis) have much shorter periods than planets that are farther from the sun. For example, the planet Mercury, closest to the sun, has an orbital period of 88 days. Neptune, which is 30 times farther from the sun than Earth, has an orbital period of 165 Earth years. Question: Given the elliptical planetary orbit shown above, identify the interval during which the planet travels with the highest speed. Answer: (1) Interval P1 to P2. Because Area 1 is equal to Area 2, we know that the time interval from P1 to P2 must be equal to the time interval from P3 to P4 by Kepler’s 2nd Law of Planetary Motion. Since the planet travels a greater distance from P1 to P2, it must have the higher speed during this portion of its journey. Question: Which planet takes the longest amount of time to make one complete revolution around the sun? Answer: (4) Uranus must have the longest orbital period since it is farthest from the sun according to Kepler’s 3rd Law of Planetary Motion.